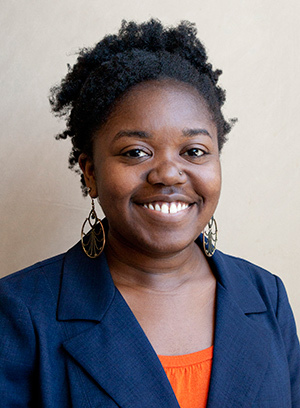 Shauna Taylor, AM '15, came to the University of Chicago School of Social Service Administration when she realized she needed to learn more about social work with an international focus to meet her career goals of studying cross-cultural social work practice and policy. “It helped that SSA is recognized as a top school for graduate social work education,” she said. Taylor, a native of Atlanta, earned her undergraduate degree in social work and psychology at the University of Georgia. While there, a faculty member invited her to work as a camp counselor through the Camp Russia Study Abroad Program in Mari El, a republic within Russia, located 450 miles east of Moscow. She explained that camp is an important cultural tradition for young people in Russia, dating back to Soviet times. “I was a counselor at Camp Lesnaya Skazka with approximately 300 youth, from ages five to 17, for a month in the summer of 2011. I went in with a double whammy – American and black. As an African American, I found the kids wanted to touch my skin and my hair. They wondered if the color would rub off. The children were excited to learn more about American culture. I was compared to and asked if I knew other African Americans like Tyra Banks, Michael Jackson, and Barack Obama. When she came to SSA, Taylor continued her interest in global concerns, serving as an International House Community Fellow. Through Laura Rosenberg, AM ’13, a staff member at International House, she learned about the Davis Projects for Peace. She applied for and received a grant for the summer of 2014 that allowed her to develop a curriculum on diversity in Mari El. Taylor, who was invited back by camp personnel, not only taught a diversity course but measured changing attitudes. She designed a survey that asked campers to describe their attitudes toward diversity. She gave the survey to campers who were onsite when she arrived. She then taught her diversity curriculum to campers in the following two sessions, giving the survey as campers complete their sessions. The survey measured changing attitudes about diversity as a result of her curriculum. During her first year at SSA, Taylor’s field placement was in the Mandel Legal Aid Clinic at the Law School, where she served as an intern with the Criminal Juvenile Justice and Mental Health projects. Working along with the clinic social worker, attorneys, and law students, Taylor helped gather mitigation materials to provide indigent clients with quality legal representation. Her second-year placement was at Heartland Alliance where she was a part of the Northern-Tier Anti-Trafficking Consortium. She helped survivors find the support and services they needed to begin again. She said she had expected to see some similarities between these clients and the survivors of domestic abuse she worked with at a shelter as an undergraduate. She looks forward to working with an organization that addresses both domestic and international human rights. “SSA has challenged me in a good way. Although I majored in social work as an undergraduate, I found I was challenged to think about things in a way that I would not have considered otherwise. It was great to hear other people’s perspectives. I was always learning from my peers at SSA.